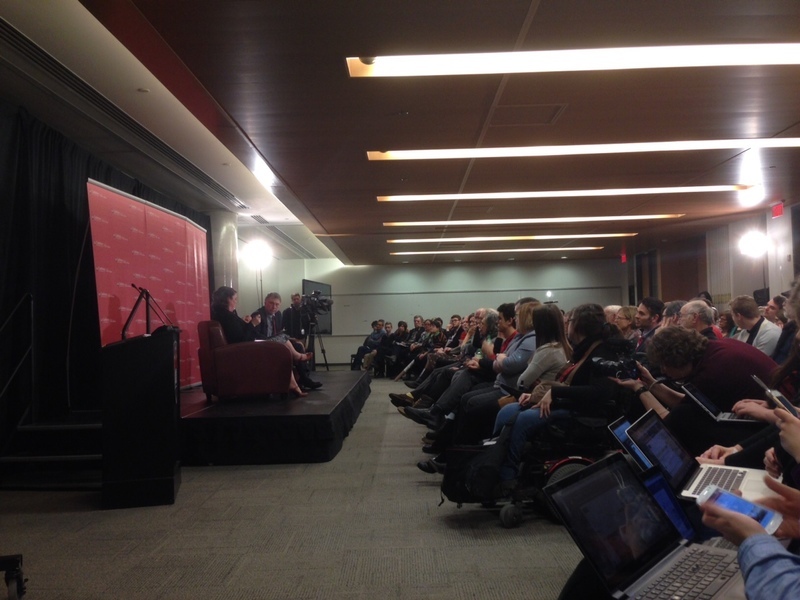 This is a live blog of the Carleton University School of Journalism and Communications' 17th Annual Kesterton Lecture, which features Washington Post executive editor Martin Baron. Tonight's sold-out crowd will hear Baron speak about his work while editor at the Post, as well as his time at the Boston Globe, where he and the newspaper's Spotlight team earned a Pulitzer Prize for uncovering years of sexual abuse cover-ups by the Catholic Church. We're under 10 minutes out from this year's Kesterton talk, "Spotlight On Journalism," with Washington Post executive editor Martin Baron. The room is packed. If you'd like to watch the Kesterton lecture as it happens, CBC is streaming it live here. And if you need a primer on what this year's Kesterton is all about, here's a quick idea. Baron and CBC's Robyn Bresnahan, tonight's moderator, have taken the stage. There's a lot of buzz in the room – from journalism students, faculty and members of the public alike. Pretty diverse crowd here tonight. Baron is perhaps best known for his role in the Boston Globe's Pulitzer Prize-winning investigations into repeated sexual abuse cover-ups in the Catholic Church. More recently, he's taken the helm of the Washington Post, a renowned U.S. media organization that continues to be successful and cutting-edge, even as journalism's business model changes. Carleton journalism professor Allan Thompson now introducing Baron and Spotlight. "It's the 'All the President's Men' of our generation . . . it made me proud to be a reporter." "Where Marty Baron goes, Pulitzer Prizes follow." This is Bresnahan's second public conversation with Baron. They spoke this morning on CBC's Ottawa Morning. Check out that conversation here. Baron says the first time he saw Spotlight, his friends didn't think it captured his joyful side. "I wasn't (joyful) then," he says, to laughs. It was a tense time at the Boston Globe, with current events and job losses, he says, and he was an outsider. "When somebody says the truth may never be known, that should be chum for journalists." Baron says Spotlight's story wasn't meant to go after the church, but rather to go after a story that was right in front of them. It's interesting: in retrospect, it seems so obvious to go after a story on rampant sexual abuse in the Catholic Church. But it's clear that there was a lot of reluctance – in terms of negative reactions – to pursue it. Baron says they prepared for public pushback, but it never materialized. Fun fact: the Catechism Cardinal Law gives Baron after their meeting in the movie Spotlight is the one the real cardinal gave the real Baron in real life. Baron says the Globe's impact on the Catholic Church's practices was huge, stretching all the way to the Vatican. But reforms still not enough and varyingly applied, he says. Cardinal Law, who was actually promoted within the Church after Globe stories profiled abuse in Boston's Catholic parishes, was only held accountable in the public domain, says Baron. Oddly, warmest press reception for Spotlight was in Rome, says Baron. He speculates it is because of how closely they feel the pressure of the Catholic Church. "I don't think investigative journalism is history." Baron says not holding powerful institutions and people to account would be "the most irresponsible thing we could do." Readers are grateful for good investigative journalism, Baron says. It pays dividends for newspapers, even if not right away. So far, we've talked about Spotlight, investigative journalism and RBF. The Washington Post's new building has a reputation for being a palace for journalism. Baron says the newsroom has glass walls, a focus on new media and about 80 engineers and designers working side-by-side with journalists. "The reality is people are reading digitally." The Post surpassed the New York Times in online readership last year. Baron says the Post has moved in a digital direction, but that doesn't mean it has abandoned any of the principles of journalism. Read more on the Post's digital shift here. Baron says billionaire Jeff Bezos, who recently purchased the Post, told him to cover Amazon as he would any other company. Facebook and Google are newspapers' biggest competitors – "giant vacuum cleaners fro advertisers" – says Baron. But they're also partners, what allow Post articles to be shared. "Frenemies," he says, to laughs. Lots of journalism students covering the Kesterton here tonight. Big crowd, too. No doubt there will be lots of questions for Baron once the floor is opened up. "I never thought the tablet would save journalism . . . We've always been looking for the moonshot. There's no one answer." Interesting analogy: journalism could be thought of as luggage. Wheels on luggage, a simple change, made a huge difference to how people travel. Journalists should look at small changes it can make to make itself better, Baron says. Wheels on luggage, not moonshots. Baron says using newspaper-style stories never worked for radio or television, so why should it work for online or smartphones? “We had a business model of cutting down trees and throwing our product at people’s doors. You have to wonder.” - Marty Baron. Lots of people up for questions. Clearly a lot of people are interested in the Spotlight story and what Baron thinks about the future of journalism. Baron says the beauty of Spotlight is that it accurately portrays what investigative journalism is all about: hard work, and lots of it. Spotlight employees say they suffered from PTSD after hearing so many horrific stories of sexual abuse by Boston clergy. Baron says he wasn't aware of how much mental resistance it took to cover that story. Interesting question on national security question from the audience. "Are there more Edward Snowdens out there? And are you trying to find them?" Baron says a lot of government officials are afraid to talk to the press at all. He says they feel it's the safest thing to do. "Getting the information is easy to do. Gathering the information is hard." What's the relationship between an editor and his publisher? Baron says he's been fortunate enough to always have supportive publishers, even when covering controversial topics. He says it's probably not always the case, but he wouldn't work somewhere where journalism is compromised by a paper's management. Baron says the Post needs more traffic, more new readers and enough people who are regularly impressed by their content to subscribe in order to stay viable. "I don't think press coverage correlates with how well someone does in the race for president." Baron says his parents were always interested in the news and the world. He says he must have absorbed it and he knew from high school he wanted to be a journalist. And another piece of advice: be an optimist. "Just because it's difficult, incredibly difficult, doesn't mean it's impossible." "What's your investigative journalism pitch for a newspaper owned by a hedge fund?" Tough question from the audience. Baron sits up and takes a deep breath before his answer. Laughs from this sympathetic audience. Baron's answer: Investigative journalism is important to the industry, and newspapers wouldn't be newspapers without it. And that's a wrap! Susan Harada, Carleton's Assistant Director of the School of Journalism and Communications, now giving final remarks and thank yous.